What are Canadians to think of the continuing political squabbles over how to divvy up the federal government's surplus? Up to now, the debate has centered on how different payment methods might impact provincial budgets, and which premiers end up as winners (or losers) if Ottawa's $11.3-billion equalization program is again enriched. But where do Canada's taxpayers - the folks that created this surplus - fit in? It is sheer lunacy to have the province contributing the most to equalization - Ontario - with a lower fiscal capacity than any recipient province. Equalization is meant to raise "have-not" provinces onto a level field, not thrust them ahead of the pack. The demands of some of these "poor" provinces are so absurd that Dalton McGuinty is now starting to look like the taxpayers champion. Ironically, the Ontario premier is the politician who broke a solemn pledge made to the Canadian Taxpayers Federation and provincial voters not to raise taxes. Within months of winning office, however, he quickly broke his promise and hiked income taxes. Yet even a rascal can be right from time to time - Mr. McGuinty's belief that equalization should not be increased is essentially correct. British Columbia Premier Gordon Campbell has stated Ottawa should reduce the tax burden paid by families before any increase to equalization or federal transfers. But Mr. McGuinty has taken the bulk of criticism - particularly from Quebec Premier Jean Charest - for stating in the clearest terms the folly of more equalization, "The problem with equalization on its own is that it benefits just some Canadians." Manitoba Premier Gary Doer's dimwitted remark that it is "anti-Canadian" to oppose more equalization was anything but useful. Where Mr. McGuinty goes astray is his argument that Ottawa should instead transfer its surplus directly to provincial coffers on a per capita basis - an adjustment that will no doubt benefit Ontario because of its large population. Ottawa's payment to provinces and territories is already large enough. This year Ottawa will transfer over $60-billion to provinces and territories (this includes federal tax points, cash and equalization), an amount that will increase automatically each year over the next decade. As for the belief provinces are short changed, that too is grossly inaccurate. It is not only Ottawa that is awash in surplus cash: All provinces with the exception of Ontario and tiny P.E.I are running budgetary surpluses. There is no federal-provincial fiscal imbalance. What needs to be curtailed is Ottawa's intrusion in areas of provincial responsibility. The solution is not for Ottawa to collect taxes and immediately send the cash to provincial capitals for locally delivered programs. Where's the accountability in that? Rather the federal government should replace its $30-billion cash transfer to provinces and territories for health care, education and welfare with equivalent tax points. (Equalization will remain intact.) Such a reform will moderate Ottawa's overreach into provincial jurisdiction; ensure provinces have secure tax revenue for these important social programs; and provide greater accountability and transparency to voters. As important, there will be no increase in taxpayers' total tax bill. This idea is not new: It was a major policy proposal made by the Conservative Party in the 1997 federal election, led by then-Conservative Jean Charest. With nearly every government swimming in surplus dollars the only imbalance is between Ottawa and taxpayers. Federal surpluses should be returned directly to Canadians via broad-based income tax cuts. If provinces still insist they need more money, premiers are free to go directly to taxpayers and increase provincial taxes. This is something most will not do (or in the case of Premier McGuinty do again) and for good reason - elections are just around the corner in several provinces. 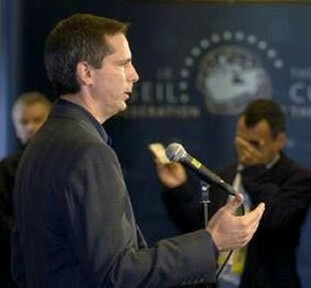 John Williamson is the Federal Director of the Canadian Taxpayers Federation.